CueAssist is a set of software and hardware components for building automation systems for stage shows. In particular CueAssist has been optimized for assisting with the presentation of live animal shows in situations where a dedicated sound and effects technician is not present during the performance. 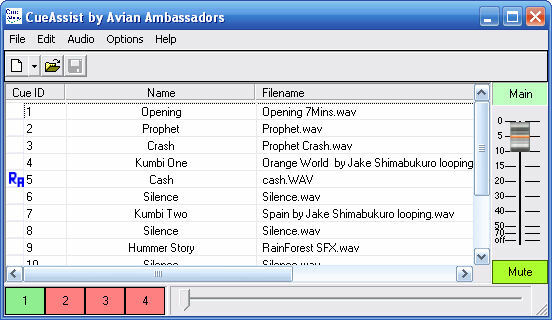 The core of the system is a Windows software application, CueAssist, that monitors input commands from a series of USB connected modules for the triggering of music, sound effects, and animal release boxes. Control of animal release boxes is provided through either wired or wireless control boxes. "CueAssist lets my one man show have the music and sound effects traditionally reserved for large, big budget shows." CueAssist "Shows" consist of a set of cues that are controlled using a combination of on-stage triggers and pre-programmed events. Live stage shows, particularly those with live animals, do not follow a strict timeline; CueAssist provides a flexible control system that with careful show design can be operated by the on-stage presenter with the minimum of intervention. CueAssist was developed by Avian Ambassadors and is in use in our traveling free-flight bird shows. This site and all content is the copyright (2003 - 2013) of Sid Price, unless otherwise explicitly stated.